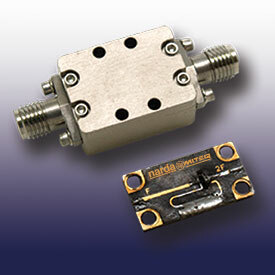 L3 Narda-MITEQ designs and manufactures a broad range of passive and active frequency multipliers. You will find a wide variety of standard designs which will meet typical applications. 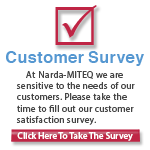 Most of L3 Narda-MITEQ's frequency multiplier designs perform to specific customer requirements and cannot easily be categorized into standard products. Parameters such as frequency range, bandwidth, spurious rejection and multiplication ratios are normally determined by specific system requirements. These requirements, in turn, translate into custom-designed filter and amplifier specifications at the multiplier design level. Please contact L3 Narda-MITEQ regarding your specific requirements. L3 Narda-MITEQ maintains dedicated engineering resources to modify our standard designs in support of custom-generated specifications that are typically required in stringent system applications. These critical requirements often require high spectral purity. L3 Narda-MITEQ can obtain high levels of fundamental and spurious signal suppression as required in many frequency source applications by employing special filter technologies. In addition to custom-filter designs, L3 Narda-MITEQ also has advanced amplifier technologies which, when combined with balanced multiplier designs, offer high performance active multipliers especially in the areas of shaped frequency response and desired output levels.